Transportation Minister Yisrael Katz says Israel must not allow a land corridor between Tehran, Beirut; calls on US to take the reins. 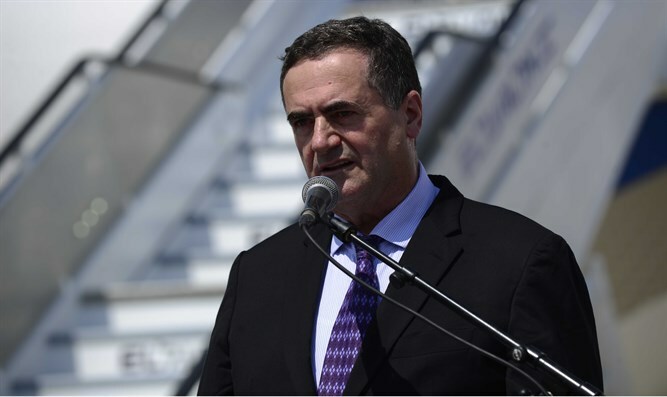 At the El Al ceremony celebrating the arrival of the first Dreamliner aircraft in Israel, Transportation Minister Yisrael Katz (Likud) spoke about the US-Israel relationship and its connection to Iran's growing regional power and its stronghold in Syria. "The purchase of Boeing's Dreamliner planes is an expression of El Al's development and its integration in the 'open skies' policies," Katz said. "It also shows the depth of the civil relationship between Israel and the United States." According to Katz, the pact between Israel and the US is based on shared values and identical interests. This pact, he said, is what provides the Middle East with stability. "Israel is the only democracy in the Middle East, and the only ally the US can rely on during moments of truth," he explained. "We share intelligence information about ISIS' and Al Qaeda's Sunni terrorism, as well as on Shiite sabotage and Iran's support of terror." Katz emphasized that Israel cannot allow Iran to develop a stronghold in Syria and open a front on Israel's northern border. "We cannot allow Iran to open a land corridor of terror connecting Tehran and Beirut," he said. "The US must return to its former position of leadership and power in the area." "The policy behind every outgoing US government has failed. It has allowed Iran's wicked corridor, backed by Russia, to arrive at influential and critical areas which threaten US allies in the area. "Israel will not allow Iran and its proxies to set up house on our northern border and threaten Israel's home front and national infrastructure. We will do everything we can to prevent this."